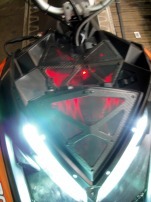 On this sled, we took some time to build a central distribution wiring splitter to send the LEDs color all from one point, instead of chaining all the lights end to end. 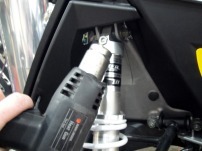 The new chassis has a central point in the steering post area and making wiring more challenging than a typical sled or motorcycle. 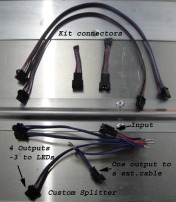 By modifying the cables in the kit, you can easily distribute light where you want without having return wires. 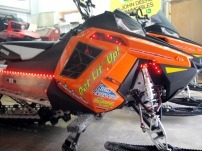 The sled is our Brite Lites project sled and equiped with many mods to make it perform nicely. 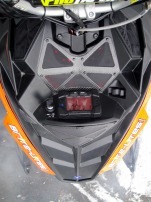 engine modes from SLP & Bikeman Performance, Exterior venting in side panels and intake are carbon fiber Fire N Ice vents- very trick! I custom made a junction cable for the LEDs to connect to and then into the control box. All the pieces are in the kit.